With 6 more weeks of winter on the horizon (thanks Punxsutawney Phil), we’re looking for any excuse to bust out our chinaware and brunch. 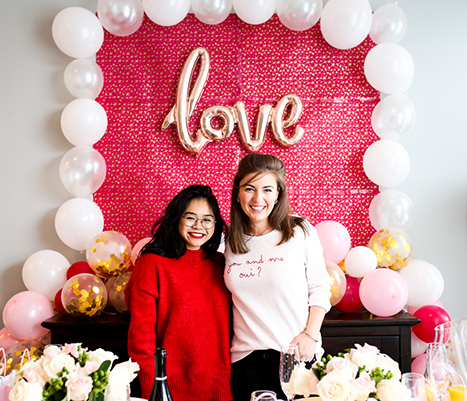 Seeing as Valentine’s Day is nearing closer and closer, we tapped our friends from Girl Meets Party to plan the ultimate Galentine’s Brunch, full of handmade touches and female friendship. Here’s Jen from Girl Meets Party! 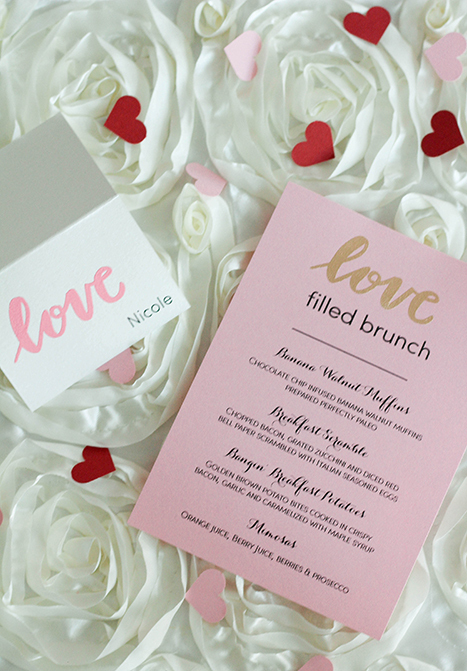 Valentine’s Day is the ultimate paper holiday, and we’re celebrating it in a big way with a Galentine’s Day brunch featuring nearly all Paper Source items. 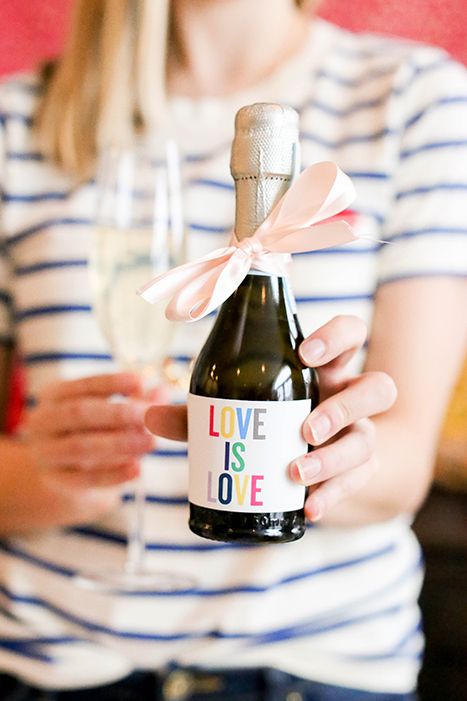 Discover how to host the ultimate Galentine’s Day brunch below from the back drop to the menu to all the little details in between. 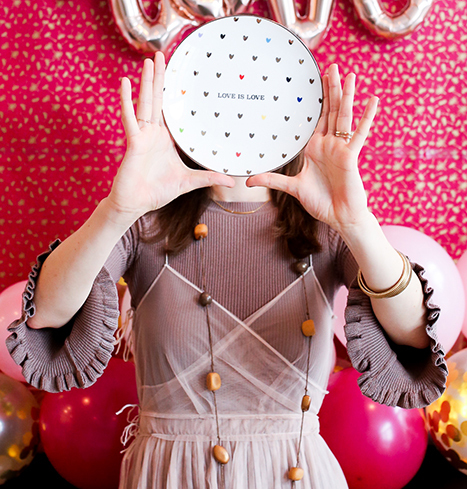 For the backdrop, we used six sheets of the Dandelion Puffs on Fuchsia Paper, which is perfect to double as gift wrap after your party. To minimize shadows and gaps, we taped the front of the paper. We framed the paper with white balloons and placed a love balloon in the center. 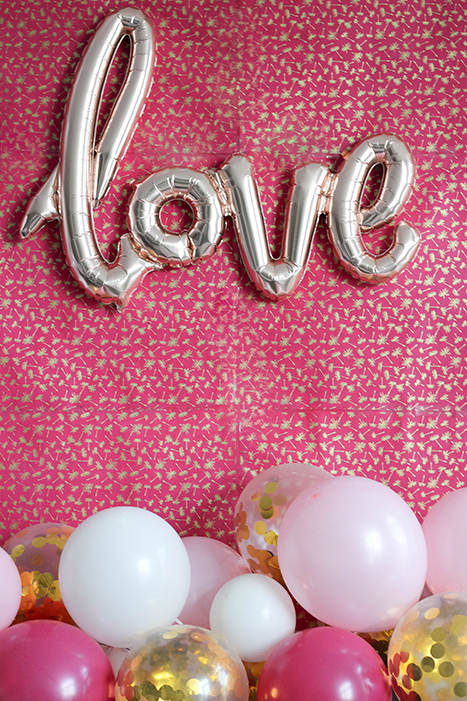 The balloon runner was the cherry on top, which you can find the tutorial for on Girl Meets Party. Our menu template is one of the favorites from Girl Meets Party. For Galentine’s Day, it was enchanced with a golden embossed love stamp at the top, which was created from the Love Script Stamp, Gold Embossing Powder and the Embossing Heat Tool. The menu was completely paleo and healthy for all guests. The paleo muffins were a huge hit among the ladies along with the other items on the menu. 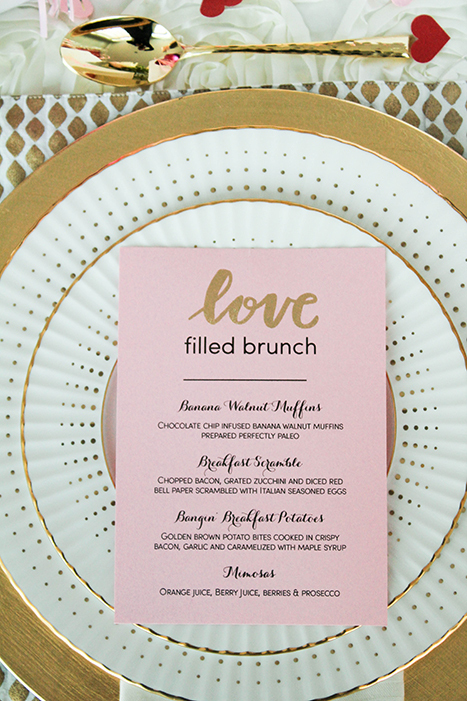 The Lenox Golden Waterfall plates served as the perfect backdrop for these delicate menus. 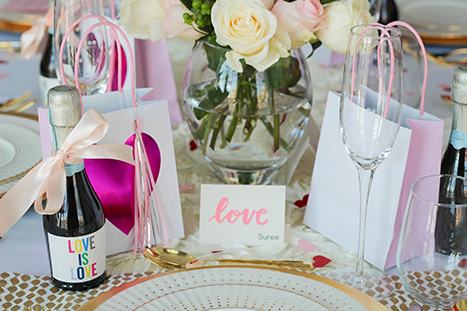 The confetti was the easiest to create and a perfect hand-made touch to add additional color to the table by using the Heart Punch and a combination of pink and red business cards from Paper Source’s Paper Bar. Each business card made 6 hearts. We created a combination of 12 pink and red hearts in each section of the table, which counted as in between plates. For the center of the table, there were approximately 36 hearts. The place cards were our favorite detail at the table primarily because of the pink embossed ‘love’ on the each card. The Silver Shimmer Place Cards always print extremely well with an inkjet printer. To create them, we set our paper size to place card size (3.5” x 5”) and added names in a sans serif font in the bottom right hand corner. Print one as a test to ensure there’s a enough space for the stamp. Then, we used the Love Stamp, Pink Embossing Powder and the Embossing Heat Tool to add some textured detail. Love is Love plates were actually the inspiration behind the entire event – We spotted these at Williams Sonoma in Lincoln Park and fell in love. The champagne labels from Gardenia Labels were a crowd pleaser as were the Mini Heart Foil Gift Bags from Paper Source. 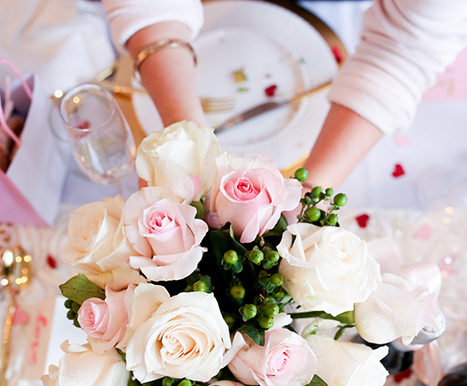 Roses paired with lush greenery from a local grocery store are a go-to for brunches unless we’re working with a florist. This brunch was such a lovely time to come together and celebrate love for one another, ourselves and the exciting goals that lie ahead for 2018. 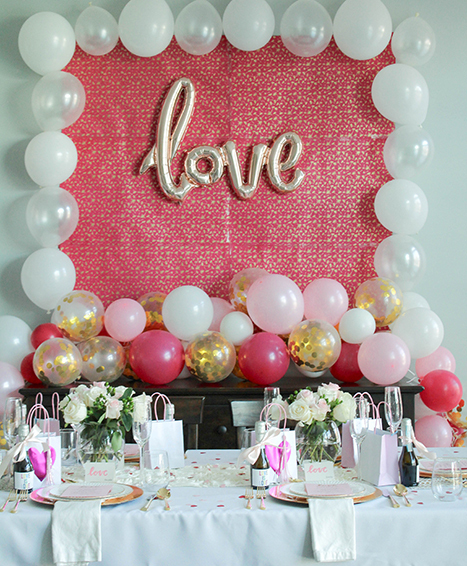 Get more inspiration below or visit Girl Meets Party for added ideas. 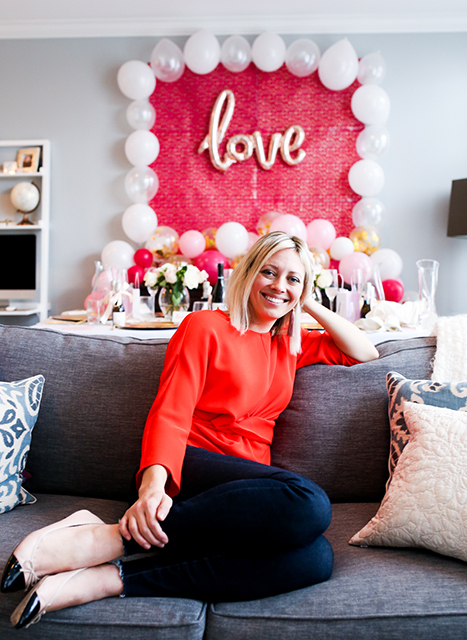 Jen is the creator of Girl Meets Party, a lifestyle site celebrating gifting, entertaining and decor. She’s been head over heels for hosting since she had a play set of table & chairs at age five. In her spare time, she loves to explore Chicago with her husband, try new restaurants and hit up the local farmers market. That was really beautiful and lovely. Lovely blog. very beautiful and classy decoration.